Captain Michael J. Murphy was born in Fallbrook, California and grew up in Alexandria, Virginia. He graduated from the United States Naval Academy in 1983 with a Bachelor of Science degree and designated a Naval Aviator in January 1985. Following transition training in the SH-3D/H Sea King, Captain Murphy reported to the Wyverns of HS-12 in January 1986. Deploying aboard USS MIDWAY (CV-41), he participated in numerous western Pacific deployments including Operation Earnest Will. In November 1988, Captain Murphy was ordered to the Warhawks of HS-10 in San Diego, California as a member of the initial cadre of SH-60F instructor pilots. While attached to HS-10, Captain Murphy served in a variety of billets culminating as the Standardization Officer. As a follow-on assignment in April 1991, Captain Murphy reported to CCG-1 as the Assistant ASW officer. In addition to completing numerous battlegroup workups, Captain Murphy was temporarily assigned to the 3rd Marine Air Wing and assisted in the establishment of the Joint Rescue Coordination Center in Mogadishu, Somalia for humanitarian relief in support of Operation RESTORE HOPE in December 1992. In July 1993, Captain Murphy reported to the Air Command and Staff College in Montgomery, Alabama. While completing the Air Command and Staff curriculum, he received a Master of Science degree in Political Science at Auburn University in Montgomery. Following refresher training in the SH-60F, Captain Murphy served as the Operations Officer while attached to HS-10 until November 1995 and later ordered to the Eightballers of HS-8 aboard USS NIMITZ (CVN-68). Serving as the Safety and Maintenance Officer, he made deployments to the North Arabian Sea and Persian Gulf in support of Operation SOUTHERN WATCH. In March 1998, Captain Murphy reported to the Chief of Naval Operations staff aviation training branch (N889). He served as the HS/HC/TACAMO community training class desk responsible for all facets of platform graduate level training. In March of 2000, Captain Murphy reported as Executive Officer of the Eightballers of HS-8 aboard USS JOHN C STENNIS and assumed command in June of 2001. As commanding officer of HS-8, he participated in OPERATION NOBLE EAGLE and OPERATION ENDURING FREEDOM. Following command, Captain Murphy reported to the Bureau of Naval Personnel as the Aviation Commander Detailer and later as the Head, Junior Officer Assignments division. 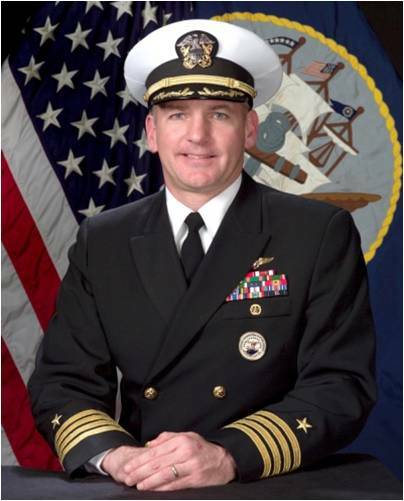 Captain Murphy assumed command of the Joint Spectrum Center in Annapolis, Maryland in June of 2005. Captain Murphy retired from the naval service in 2008. Following 6 years in industry supporting Naval Sea Systems Command/DDG1000 and LCS programs, Capt Murphy joined the civil service. He is currently employed by Naval Air Systems Command and serves as the director for Aviation Ship Integration on the PEO LCS staff at the Washington Navy Yard. Captain Murphy’s personal awards include the Defense Superior Service Medal, Bronze Star, the Meritorious Service Medal, the Navy/Marine Corps Commendation Medal, the Navy/Marine Corps Achievement Medal, and various campaign, unit and service awards.